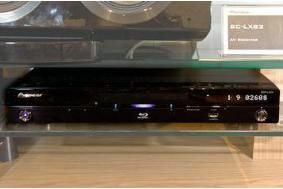 MANCHESTER SHOW 2010: Pioneer’s first 3D Blu-ray players break cover – see them on our video | What Hi-Fi? The latest version of the company's proprietary Precision Quartz Lock System (PQLS) “ensures jitterless transmission of uncompressed two-channel or multichannel LPCM and also bitstream audio over HDMI to compatible AV receivers”, says Pioneer. Connection to the internet is either wired via Ethernet or wirelessly using Pioneer's optional wi-fi LAN adapter. This enables playback of BD-Live content on Blu-ray discs (with additional USB memory), and you can also view YouTube videos and play audio, video and photo content stored on a compatible network PC or media server. Pioneer's free iControlAV app allows you to control both players using an iPhone or iPod Touch. The main differences between the two models are the use of higher quality audio components on the BDP-LX54, which also has Pioneer's strengthened Armoured Chassis designed to reduce vibrations and hence improve performance. Gold-plated terminals, blue illumination and a hair-line front panel finish also mark out the pricier player.